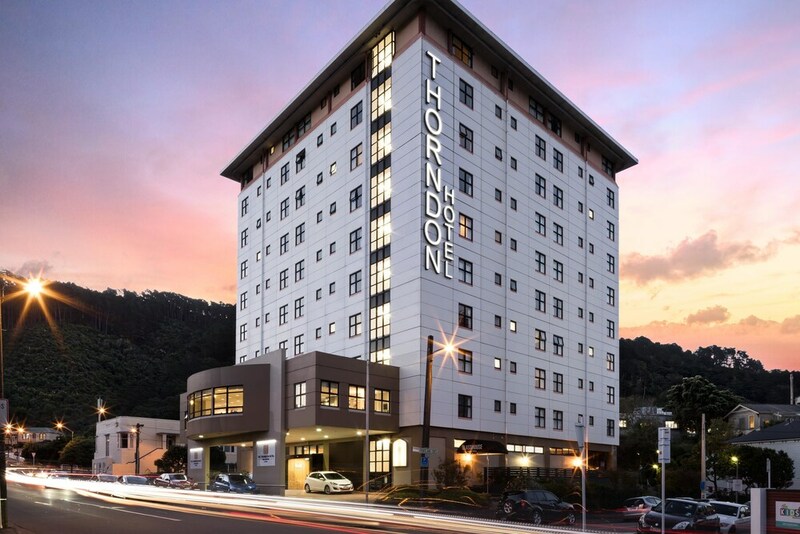 A stay at The Thorndon Hotel Wellington by Rydges places you in the heart of Wellington, within a 15-minute walk of Wellington Central Business District and Wellington Waterfront. This family-friendly hotel is 1.4 mi (2.3 km) from Te Papa (Museum of New Zealand) and 2 mi (3.1 km) from Interislander Ferry Terminal. Make yourself at home in one of the 108 guestrooms featuring refrigerators. Complimentary wireless Internet access keeps you connected, and satellite programming is available for your entertainment. Private bathrooms with showers feature complimentary toiletries and hair dryers. Conveniences include phones, as well as desks and complimentary weekday newspapers. Enjoy recreation amenities such as a fitness center or take in the view from a terrace. Additional amenities at this hotel include complimentary wireless Internet access, babysitting/childcare (surcharge), and a television in a common area. Enjoy local cuisine at Glasshouse Restaurant, a restaurant which features a bar, or stay in and take advantage of the room service (during limited hours). Buffet breakfasts are served on weekdays from 6:30 AM to 9:30 AM and on weekends from 7 AM to 10:30 AM for a fee. Featured amenities include a business center, express check-in, and express check-out. Planning an event in Wellington? This hotel has facilities measuring 3229 square feet (300 square meters), including a conference center. Self parking (subject to charges) is available onsite. Wireless Internet access is complimentary. Event facilities measuring 3229 square feet (300 square meters) include a conference center. This family-friendly hotel also offers a fitness center, a terrace, and tour/ticket assistance. Limited onsite parking is available on a first-come, first-served basis (surcharge). The Thorndon Hotel Wellington by Rydges has designated areas for smoking. Buffet breakfasts are available for a surcharge on weekdays between 6:30 AM and 9:30 AM and on weekends between 7 AM and 10:30 AM. Glasshouse Restaurant - This restaurant specializes in local cuisine and serves breakfast, lunch, and dinner. Guests can enjoy drinks at the bar. A children's menu is available. Happy hour is offered. Open daily.